Those who are used to follow my market analysis hear this from me a lot that this support or resistance level is not strong enough, but this one is. What novice traders have a hard time to understand is that why a support or resistance level is weak and the other one is strong? What makes them weak or strong? This is what they ask me a lot. Before I answer this question in more details, first I have to explain what do I mean by “level” and what is the difference of support/resistance levels and lines. It is harder for novice traders to deal with support/resistance lines. They are more complicated and technical and it needs a lot more experience and knowledge to trade them. However, support/resistance levels are easier to understand, because they are simply plotted below the valleys’ low and peaks’ high prices. You don’t have to be too technical to do that. The good thing is that the markets reaction to the support/resistance levels is usually stronger, more precise and less tricky. In the last quiz, I showed you a screenshot with a support level breakout at left, and a resistance level breakout at right. Then I asked you which of the trade setups was stronger. The above screenshot was chosen from the weekly chart of a currency pair that we don’t trade. I intentionally did it because I didn’t want you to have any mentality about it. It is USD/SGD weekly chart. Unlike the other quizzes, I didn’t hide the price movement that was formed after the trade setups. So in this quiz you could easily see how each trade setup worked and made the price move. I didn’t care about the price movement after the trade setups. Indeed, in none of the trade setups I locate, I care about the next price movements, because it is what we never know. We never know how the price moves after a trade setup. All we can do and we know how to do is (1) locating a too strong and valid trade setup, (2) choosing a proper position size based on the risk we want to take, and (3) taking the positions and setting the stop loss and target orders. We have no control on the other things including the next price movements. Therefore, I never want you to guess how the price moves after a trade setup. This is not your job as a trader. Your job as a trader is to know whether the trade setup you locate is strong enough or not. You have to distinguish which party has taken the full control. In the above screenshot, I wanted you to distinguish which trade setup was stronger. The strength of the above trade setups depends on the strength of the support or resistance levels that were broken. This is what I am going to explain in this post. Now, if you refer to the above USD/SGD weekly chart, you can easily say which trade setup was stronger, because it formed after the breakout of a stronger support level. The left side support level looks much stronger. The right trade setup was formed after the breakout of a weak resistance level. Although in both cases the price moved accordingly, this is what we never know. We can only see the trade setup and decide before the price movement. The other difference of the first and second breakout is in the situation of Stochastic Oscillator. The first breakout formed when Stochastic Oscillator was in the oversold area. This is something that usually happens in a strong support/resistance breakout. The second breakout formed when Stochastic Oscillator had already left the overbought area and was placed below it. So, Stochastic Oscillator can be a big help to distinguish whether the broken level is strong enough or not. Below is the AUD/NZD weekly chart. Please explain whether the short trade setup formed by 2015.07.19 candlestick is strong enough or not. Please consider the 1.1302 resistance level, the bulls strength before the 2015.07.19 candlestick, Elliott Waves and also the monthly time frame situation. I read all your comments but unfortunately I cannot add my comments to each of them. However, in addition to posting your own analysis, please read the others’ analysis and comment on them. Support and resistance breakout is the most reliable or at least one of the most reliable trading methods. The reason is that when a support or resistance is broken, it will work as a resistance or support, and so, it will make a barrier against the price that doesn’t let the price go against us and hit our stop loss. It means, our positions will have less risk if taken based on the support/resistance breakout, because the broken support or resistance will protect our stop loss. Of course, it is always possible that the price breaks above or below the broken support/resistance during the retesting, and this is something that happens sometimes. In spite of this, still support/resistance breakout is more reliable, because you know that after the breakout there is a barrier in front of the price that resists and doesn’t let the price hit the SL in most cases. The other thing is that with this system (support/resistance breakout), you have to make sure that you have plotted the support or resistance lines properly. Sometimes you think that you have found a good support/resistance line, and you wait for its breakout to take a position, but you don’t know that the line you have plotted is not correct. The more you practice and become more experienced in plotting the support/resistance lines, the higher number of reliable and true lines you will become able to plot, and so, your trading success rate goes higher. Plotting the true and reliable support and resistance lines are a little technical and need more experience. However, there is an easier way to use the support and resistance to trade. You can trade the support and resistance “levels”. As you see, there are so many support and resistance levels formed while the price moves and goes up and down. When the price goes up and then turns around, we will have a peak or resistance level (the small red horizontal lines). And when the price goes down and then turns around, we will have a valley or support level (the small green horizontal lines). How Can We Trade Using the Support/Resistance Levels? 1. To go up, the price has to break above the resistance level, otherwise it will stay below the resistance level, and will either form a range or will go down and form a downtrend. When we have a resistance level, we can go long if the price breaks above this level, because “usually” when the price breaks above a resistance level, it will go higher and will form another peak or resistance level which is higher than the previous one. 2. To go down, the price has to break below the support level, otherwise it will stay above the support level, and will either form a range or will go up and form an uptrend. When we have a support level, we can go short if the price breaks below this level, because “usually” when the price breaks below a support level, it will go lower and will form another valley or support level which is lower than the previous one. We either have a trend or a sideways market. When the price keeps on breaking above the resistance levels, we have an uptrend. So we can set buy pending orders (buy stop) above the resistance levels, and go long each time the market breaks above a resistance level. The stop loss can be set several pips below the resistance level, because we expect the broken resistance level to work as a support and not to let the price go down. Therefore, we can place the stop loss several pips below the resistance level. The target can be at least twice of the stop loss size. As you see, you will have a lot of trading opportunities with each trend. You can use moving averages for the trending markets too, because this system is perfect to locate and verify the trends. You can use it to locate the trends, and while the trend is ongoing you can trade the support/resistance levels the way it is explained above. To have a higher success rate in support/resistance levels trading, learn the MA system and use it to locate the trends, and set your pending orders while the trends are strong and ongoing based on the MA situation on the charts. This is how you can use the support and resistance levels to trade. It is much easier and more mechanical in comparison to support/resistance lines, but you have to keep in your mind that your stop loss will be triggered with any trading system, and there is no trader who can be a winner 100% of the times. Any trading system has a risk level, and the more you practice and gain experience, the higher success rate you will have. Locating the support and resistance lines are the most important part of technical analysis. Support and resistance lines are the foundation of technical analysis. To trade based on the support and resistance breakout, first we have to locate the correct support and resistance lines, wait for the price to breakout out of them, and then take the proper position. We buy after a resistance breakout. We sell after a support breakout. If you connect the most visible highs to each other, you will have a resistance line. If you connect the most visible lows to each other, you will have a support line. Most traders prefer to use the close price or line chart to plots the support and resistance lines. The reason is that the lines that are plotted based on the close price are more stable and valid and markets react to these lines more accurately. 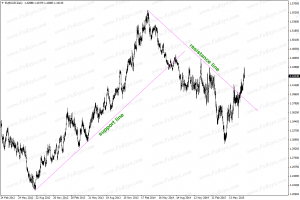 Therefore, to plot the lines based on the close price, you have to switch to line chart. A resistance line will be known as a broken resistance line when the price goes above it. If a candle closes above the resistance line, then the resistance breakout will be stronger and more reliable. To be at the safe side, you can wait for a candle to close above the resistance line. Then you can go long with more peace of mind. In this example (watch the video), first we plot the resistance line based on the high price. As you see, the price has broken above the resistance line here, but it did not keep on going up, and it went down. It went up strongly only when this candle closed above the resistance line. That’s why we recommended to wait for a candle to close above the resistance line to take a long position. Now we try plotting the resistance line using the close price or line chart. We connect the most visible highs here. The difference is that using the close price to plot the lines will save us from losing money on false breakouts. You can use both methods at the same time and compare the result. After plotting a resistance line, we wait for a candle to close above it. We will buy when the candle is closed and the next candle is opened. We set the stop loss several pips below the resistance line. The target can be at least 2 or 3 times bigger than the stop loss size. In the example, we have a 55 pips stop loss. And as you see the price goes up after the resistance breakout for over 220 pips. Therefore, our target could be easily triggered. This is how we buy, after a resistance breakout. It is the same with the support lines. First we plot the support line and wait for the breakout. This support line is plotted based on the close price. This one is plotted based on the low price. Then we wait for the support breakout. Here, this candle has closed below the support line. We could sell at the close of this candle, set the stop loss several pips above the high price of that candle, and set the target at least 2 to 3 times of the stop loss size. You could use one of the support lines, either the one that was plotted based on the close price, or the one that was plotted based on the low price. Having both of them on the chart, helps you be more confident about the position you take. 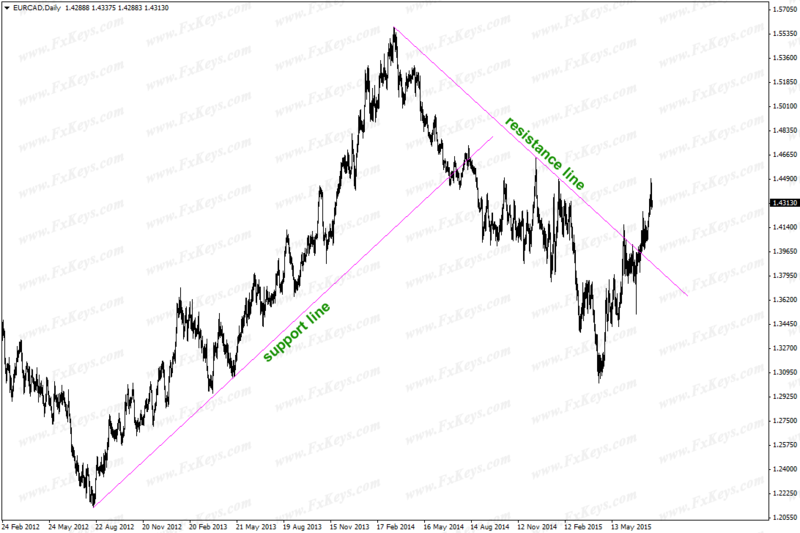 This is another example of a support line, plotted based on the close price. This candle has closed below the support line, so that a support breakout formed. We could take a short position at the close of this candle, and set the stop loss several pips above its open price. A broken support line will work as a resistance line after the breakout. It means the line that was working as a support line, will work as a resistance line after the breakout. Therefore, sometimes after the breakout the price goes up to retest the broken support line as a resistance. As you see in this example, the next 2 candles that formed after the breakout candle, went up and retested the broken support line. However, the broken support line worked as a strong resistance and did not allow the price to break above it. So the next 2 candles closed below the broken support. It is the same with the broken resistance lines too. A broken resistance line will work as a support. It means after the resistance breakout, the broken resistance works as a support. After the resistance breakout, sometimes the price goes down to retest the broken resistance line. If the broken resistance line works as a strong support, it does not allow the price to go down and break below. Therefore, the price will close above the broken resistance line and will go up after that. Sometimes the price retests the broken line for a few times. Some traders wait for the price to retest the broken line, before they take any position. The reason is that, retesting tells you if the broken line is a valid line, and the breakout is a reliable breakout. If the price can NOT break the broken line during the retesting, like what you see here in this example, it means the line and the breakout is valid, and we can take the position. And, sometimes the price succeeds to break the broken line during the retesting. It means either the line is not a valid line, or the market condition is changed and the breakout is not valid anymore. In this case, we’d better not to enter the market, and wait for the next trade setup (of course if we have not entered already). Very good to know these little details!! The long term trend is down, so hopefully price will retest and provide us with a too strong short set up in the next few months. This is what I too never knew all this time I have spent on charts! It seems to me is revealing the mystery behind market!! ok I will give it a try! In pure candlestick terms, there is not a lot of breakout of the Bollinger Band which is not a positive point, however the weekly bearish candle of 19/07/2015 engulfs completely the previous bullish bar, at the resistance level of 1.13. So a engulfing / dark cloud which is pretty strong, after a inverted hammer signalling that the bears wanted to take control, and seems the got it as the aggressively reacted to the bullish bar of 12/07/2015. In terms of Elliot waves, that can fit onto many different scenarios, but I could argue that the bullish move from the 19-april has the 1-2-3 waves, then wave 4is formed by the inverted doji of 28/06 and bearish bar of 05/07, and wave 5 from low of 28/06 bar to high of 12/07 bar. So we would be in wave A at the moment, and this would support further movement down. Regarding the monthly price is creating a nice dark cloud pattern which could also support that bearish have the control and this baby wants to go down, although the mid-BB approaches and could be a reaction at that stage. I was going to write my own conclusion, but I found Serge’s one fits into mine. – Purely looking at candlestick, it is not a strong set up. It does not go out of the BB breakout too much. So, it’s just an ordinary breakout, not even scoring 90. – Looking at the Elliot Wave, again it’s the start of wave B, which is a short term downtrend. It pays to wait until wave C and take a stronger bullish setup. – I can’t really tell much from monthly chart. It could be that we are on the middle of wave 2. I can’t tell much from this monthly chart. For me it is not strong enough because the 1.1302 level is strong resistance, it is right on top of a bull movement which is wave 1 and the bear candle on the monthly tf is reacting to BMB. AUDNZD short trade reacted to the strong weakly RL. Although the bulls took the price up with momentum, the short trade setup could be the beginning of Wave B or 2. In addition, the bulls couldn’t take the price above the monthly RL. I can see an inverted HEAD and SHOULDER formation. I will wait for further confirmation to go long. My opinion is it is not a strong enough set up because the resistance level is weak and it formed at the top of a strong uptrend so it could be a continuation signal. I don’t know where to overlay Elliott’s wave yet so i can’t comment on it, the stochastic on the monthly is near 20 and the the macd crossed over to the upside. Obviously I still have a lot to learn. For me this is a weak setup, i wouldn’t take it. the setup does not fully match the strong one. it is more like 80-90 points setup. 1. the 1.1302 resistant level is a weak one as the sochastic oscillator was not in the oversold position. 2. the bulls appear to still have the control of the market. 3. Elliott waves is about forming wave 2. 4. Though the candles forming the setup are big,there was no breakout of bb. 5.on monthly time frame too,sochastic oscillator was not in oversold position. 6.it is therefore a weak setup. (1)In weekly chart the candle 19.07.15 and previous few weekly candle didn’t close above 1.1302 the resistance level. (2)One of them had a long upper shadow but next candle was not confirmed for go short. (3)In monthly time frame it also failed to go above the resistance level. (4) So in monthly TF it could go down to create wave B at 1.0450 the support level. (4)After compilation of wave B, We shall enter at the begging of wave C and that is our target now. 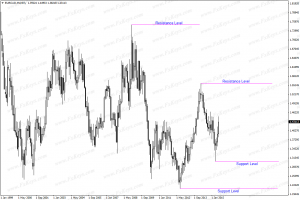 N.B : Weekly analysis of AUD/NZD can be read again from Mr.’s article dated 05.07.15 and 12.07.15 for a clear idea. Thanks. The Bollinger Band breakout has not formed, the previous movement contains several strong bullish candles which shows that the movement is not exhausted. b) according to the Elliot waves, we are on the beginning of the Wave B, which is a short move in the opposite direction of the Wave A. And the resistance level of 1.1302 is a strong one so I will wait for its breakout by the Wave C to have a valid long setup. Thus for me it is not a strong short setup. This is a good short since the prevailing trend is down and we are at resistance and have a strong upper band wick with a strong price rejection as the result. I would at least expect the price to go down to middle band. short trade setup formed by 07/19/2015 candlestick wave C (by Elliott Waves). Bearish movement which began in late 2011 looks exhausted and probably the price begins to go into sideways movement. Short trade setup formed by 07/19/2015 candlestick is wave C (by Elliott Waves). Bearish movement which began in late 2011 looks exhausted and probably the price begins to go into sideways movement. Short setup 7/19/2015 itself looks pretty strong. I would say the short trade setup formed by 2015.07.19 weekly candlestick is strong enough. I am considering the 1.1302 resistance level has been tested approximately five times on the weekly chart, on 2014.08.31 and on 2014.10.26, then on 2015.06.14 and on 2015.07.12. The 2015.06.28 candlestick attempted to break the resistance line but it retreated below it. The bulls strength before the 2015.07.19 candlestick was pretty strong that they managed to close 9 pips or so above the 1.1302 resistance level but the bears came back stronger and pushed the price much further below the resistance level (247 pips?). I have no idea on how to use the Elliott Waves for now. I’d go short but manage my risk. I will say that this is a weak short-trade set-up. If you extend the 1.1302 R/L to the left of screen it will line up nicely as a former support. Price has been rejected at this level before and this time you can see a long shadow(attempt) to break the R/L. I have been trading Support and resistance levels for the last couple of months however I have been trading the rejection of these levels. is this also a type of trading? I find if the candles show a rejection I will place a trade. I find it easier as the candles tell a story of the buyers and sellers. I know my comments are not on point for this article, I would love your opinion on what I’m doing. I’m still a novice and my demo has started to show some profit since doing this rejection method. Yes. It is possible to trade the rejection too. weak resistance level 1.1302 might take aussie down a few pips formed by a previous short trade setup by candlestick pattern 2015.07.19. and this might be the beginning of wave number 2 which resulted from the formATION of the beginning of wave 1 by long trade setup 2015.04.05..currently the monthly seems to be forming a short trade setup however let us wait for the candlestick pattern to close as always say we are traders not fortune tellers. I think it’s a weak setup but will keep down. I am really getting confused here! When I first joined LuckScout, my understanding was that it was wise to keep the trading simple. MACD SR Stockastic BB DBB Butterfly Double top Trendlines Elliot Waves and so on. I appreciate that this is a free site but is it possible to simplify the process. It has been a long time since I went to school. You don’t have to follow all those systems. We introduced them to have more options for different tastes and styles. It doesn’t mean that one has to follow all those systems. This is what I have been waiting for. Your explanation about S&R. I had already drawn what I think are the 1,2,3,4,5 and A Elliott wave lines on the the monthly chart for this pair and was thinking that the price action has now commenced to form wave B. The reversal into wave B appears to be supported on the weekly chart where you could say a high wave reversal pattern completed at the resistance level and upper BB. Regarding the previous quiz, while I agree the left hand break out was strong, no one seemed to notice the pennant pattern that had formed after the price bottomed and the fact that the price broke through this resistance line when the stochastic was above 80. The price then retested the R-line before continuing up to break the R-level. Was this therefore not a strong signal also? The short trade setup is strong considering the two candlesticks pattern and resistance stopping from the bull pressure plus many testing of the level.May be the setup is to form wave2 which is short down movement. Considering the monthly chart, it is the retesting of the BB midle band, because the market has reach to the Lowest on M/chart and is going up which make the weekly T/setup not 100%. I’m a little confused about what elements are necessary for a rejection trade but assume the BB breakout is not necessary although there was a strong BO earlier. The last bull move was too long for it to be a correction so more likely to be a Elliott Wave A after 5 waves down. This means the current move is Wave B and could retrace quickly. This is also likely because it happens at the top of a very strong bull move. The resistance level was strong with clear rejection at last attempt to penetrate but the down move is now likely to hit some support at the monthly/ weekly middle lines. The strong Dark Cloud Cover pattern may give the move some momentum and its possible it will go down to the confluence of middle lines and Fib 50. I don’t think the Stochastic needs to be part of this analysis. Look forward to your hearing your wise opinion later. Allen. Bulls strong up but candles not that strong. First wave Started @ 29/3 (piercing line) End with long shadow doji 28/6. 2 nd wave started? Monthly also acted to 1.1032. Possible price to range between 1.1032 res and 1.0023 sup. 50SMA flat . 1) Weekly price now reacted to resistance level which is not so strong level but price will move down at least until BMB. 2) This down movement will form 2nd Elliot wave. 3) Monthly chart show price start to move up after go to the lowest level which last recorded on 2005. This is not strong setup and price will move up to form 3rd Elliot wave. I will wait continuation setup to go long or use Fibo for better entry. it seems like only a matter of re-testing the trend breakout.the bulls still on control. 1)The trade setup didn’t have UBB breakout,although it reacted to the resistance level. 2) UBB and LBB are far apart from each other, meaning that the previous move(bullish ) is still in total control. 3)Trade setup is directly formed on a bullish market. 4)Even monthly chat didn’t have a strong UBB breakout. All these points show d -ve implication of d setup. Although,d trade setup can move d market a bit down which is wave 2 of Elliot wave. Candle only wicked out of BUB, then retraced engulfing candle , b4 a bull candle with exhaustion upper wick, showing bears moving in to get an engulfing bear candle , to move down to BMB. So this would rate as a 85 / 90% trade. Formed after bulls had control, was the 3 wave up generally the strongest of a 5 wave move. So this would be the alternate larger correction wave 4 b4 the start of the 5th wave to break through the resistance level. Would have been watching finish of correction to see candles for new trade to end of leg. For a reversal Trader: I think it is in a strong resistance level. For a trend Trader it looks like Elliott Wave 2. This one is not easy (for me), but what the hack! 1. the last move from 19.4.15 (Weekly) is extremely bullish AND its after a multi year low @ psychological level 1.0. 2. the 12.7.15 shows that bulls are not giving up, its not clear who have the power for now (kind like EURUSD). 3. there isn’t significant BB breakout. 4. on the Monthly since April 2011 to march 2015 the pair is EXTREMELY bearish, as I wrote – break 1.13020 level will be a conviction for bulls power. 5. Elliot wave – looks like the strong Impulse cycle ended, wave 5 was the recent bounce on 2.11.15 Weekly. now the corrective waves are taking place. Maybe I’m not right but I see A potential for long entry after 1.138 break higher and retesting as new support. 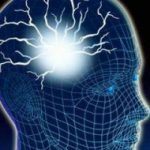 Thanks for sharing this enlightenment article. Please be assured your good work will never go unnoticed. 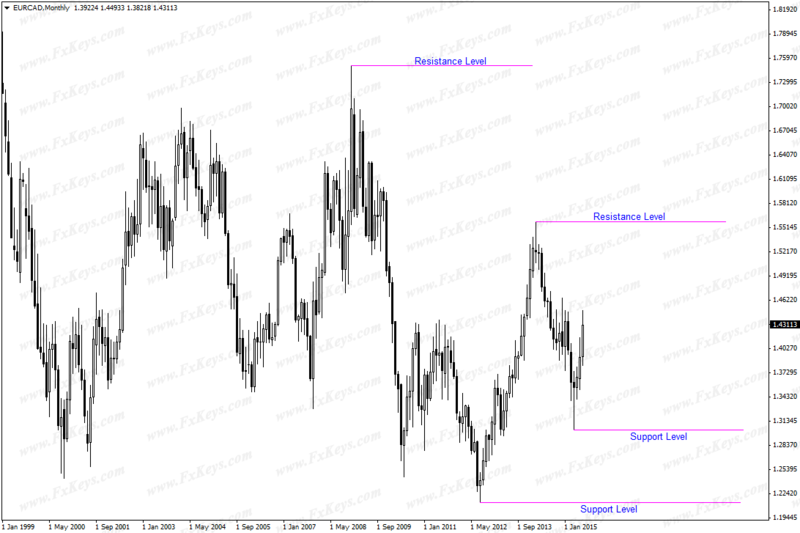 I personally think the short setup on AUDNZD weekly chart is not strong enough. – I agree with Nadi’s view that we are on wave B on the weekly chart. – This can be made valid by wave B also forming on monthly chart that has been anticipated to reach 1.04325 support level, therefore initiating wave B on weekly tf. – In my view the resistance level 1.1302, shooting star candlestick 2015.06.28 together with the dark cloud cover on the weekly tf are moderately strong enough to significantly take the price down. – Maybe there will be a price down movement of some few pips up to the middle bollinger band before a surge formation of wave C on the weekly tf and monthly too. – This is because a number of previous weekly candlestick from 2015.04.19 have strong bullish pressure, so the uptrend is not yet exhausted. 1.) Wait for a strong long signal to occur on the monthly chart around 1.43250 support level indicating wave C is taking effect. 2.) Wait for the weekly resistance level 1.1302 breakout or a strong buy signal around the middle bollinger band to go long with peace of mind because wave C will be confirmed valid. – According to Nadi’s plotted Elliot Waves (if confirmed to be valid by mentor ), those who are short might be taking a big risk because once wave C commences (the right time to go against the trend), it has a great potential to take the price even higher above 1.1302 resistance level. – The bulls are still in control on the Weekly timeframe. – Monthly is on a bearish trend and price is close to MBB. This is not a strong set up probably the trade will go up on completion of W2. I am new to and have been reading about it all over the internet for the last a couple of months. I feel myself very lucky to accidentally land over LuckScout. the short trade setup formed by 2015.07.19 CS is strong where it happened at a very strong R/L 1.1302, but not strong enough coz it came after a strong up trend and I give it 85 score. the monthly TF shows that the price had hit the max low capacity for the AUDNZD then up to encounter the strong R/L 1.1302. I was taken this short trade setup. I think it is not perfect but it is strong enough. It is not perfect setup because the resistance line is not too strong, but regarding Elliott waves (this could be a wave fife) the price should go down. There is a few weaknesses on this trade setup…. Bulls looks pretty strong on the last wave, the wave is quite steep, but last two candles on a weekly time frame react perfectly to this resistance, so it looks valid. …when I look the monthly chart it looks that last two candles didn’t react on the 1.1302 resistance level (although I do not understand this)? I have one question,i hope you will not disappoint me.suppose on strong support level breakout stochestic is just out from oversold area and week resistance breakout there is stochestic in over bought are than which setup will called strong setup. None of them are “typical” trade setups base on the stochastic trading system we introduced here. However, a strong level breakout is the most important thing in this system. + a relatively strong Bearish Engulfing reversal pattern that is confirmed by another Dark Cloud Cover reversal pattern. – the last point is that MACD signals about the divergence on the monthly timeframe (see red thin lines on M1 chart). Considering the above points it’s better to skip the current short trade setup. In my openion this setup is not strong set up as bulls are still looks effective and market doesnot looks exausted.but resistance level is looks strong and elliot wave i have no idea. Hi – belated reply – apologies dreaded internet problems! 1. The bounce up is very strong – particularly on monthly TF – not surprising as it is from a 20 year low for this pair. 2. The BB positioning and candles when the uptrend stalled feel like a stall rather than full blown retrace. 3. I’m not sure where we are in terms of Elliott Wave but the Stochastics indicate a likely retrace rather than continuation. my view is that is is not strong enough because the bulls still seem strong and also it looks like the second elliot wave is just forming which might take the price down possibly to the middle bollinger band and according to elliot waves it would then form the 3rd wave which is usually very strong and could easily break the weak resistance level. so my conclusion is that it is not very stron but it could take the price to the middle bollinger band so not very wide targets should be taken if you decide to trade this setup. Peter Mackay,I really like your comment.Also,I was absolutely sure what the answer would be.The real value of this site is that it opens your eyes for different systems and styles – all of them profitable.You have to chose the one that is suitable for you. And here is the difficult part – you have to follow it and NEVER look back :). Thank you for this article.Before my answer to the quiz am surprised that no one said that he/she is in this trade. I entered this trade three days go.But the bull is trying to threthen me now.Since am in this trade I give the reasons which at the same time answer your quiz. 1. Before this setup there was inverted hammer and was confirmed by next candle(bear). 2. Next the bull tried to take over from the bear. 3. After which there was bearish engulfing pattern,though there was no bollinger upper band breakout. 4.And most importantly, I consider that zone as a strong resistance zone which for six weeks the bulls were not able to break above. Good and informative post gives us idea about how we distinguish between week and strong support/resistance. Could you comment monthly gbp/cad. It appears to be forming stochastic breakout? They are not strong levels. It is a complicated setup to analize, but not complicated to determine it is not a 100 score setup, then following the 100 score trading system it is an easy NO trade. (It might be a tradeble setup for retracement traders). – Strong engulfing pattern. Good size and engulfing over 90% of previous candle. – Bear presure started showing its intentions to take the control three candles before in the weekly chart (2015.06.28). – Setup reacting to 1.1302 resistance level. – Not breaking BB bands at all. – Bulls still have the control in the weekly timeframe after their strong reaction to the all time low. – Monthly timeframe bulls also being strong (previous three candles)reacting to an all-time low. – On the weekly chart considering an upward movement started at 2015.04.05 candlestick, could be the beginning of wave 2, or maybe 4 due to the bullish movement being too steep. Both waves are known as retracement waves but are not tradeble (at least for us). Regarding monthly chart I could say it may be the beginning of wave B of the downward movement started with 2011.05.01 candlestick. It isnt tradeble for us too. ( We might trade waves 3, and C,maybe 5 if it is started with a really nice setup, but only 3 and C to be on the safer side which are stronger than the others ). Snipers… Save your bullets, I know its been several weeks without a prey for us, but stay focused and disciplined the market will show us a beautiful 100 score setup soon. Patience! I think there is something that was written in the article above that’s far more important than the quiz. It’ll take each trader years to get to fully adopt this mind set, I hope everyone re-read it as many times per day until they become professional. Because if you don’t, you’ll keep fighting with your emotions until you give up. “We never know how the price moves after a trade setup. All we can do and we know how to do is (1) locating a too strong and valid trade setup, (2) choosing a proper position size based on the risk we want to take, and (3) taking the positions and setting the stop loss and target orders. We have no control on the other things including the next price movements. Thank you. Yes, that part of the above post is the heart of successful and stress free trading. Thank you for your presence Youness. 1- Not long ago(07/06/2015) weekly TF on Aud/Nzd broke the resistance line and went up on a wave 3 of EW and it looks like the present set up is a downward movement of wave 4 of EW on weekly TF also the most it can go down is to touch the a/m resistance line now turned support. 2- Previous monthly candle(01/06/2015) also closed strongly above the middle band and went all the way up touching the upper BB which indicates the bulls have control. 3- Stochastic is not in the oversold area of 20 or below on weekly TF and on Daily TF either. Therefore, I think we should wait for the weekly candle to close. it looks like becoming a hammer then we need to wait for next week close if confirmed also if closed above the resistance level of 1.1302 then the set up is ready for a bullish wave 5 to go long. This, in a nutshell, is why I love you,. In my mind, some complicated and mysterious internal calculus was involved in distinguishing weak from strong support and resistance. Instead, you explain in simple terms what has been in front of our eyes all along. That’s LuckScout, baby. THAT’S LuckScout!! This set up is weak to me. Bollinger bands are far apart and therefore l think price is merely reacting to that level. The bullish advance is still fresh on the weekly chart. Looking at the monthly time frame, price is coming from it’s lowest point, this is possibly the beginning of a much larger uptrend. l have trouble with elliot wave and so l cannot comment on that. I have heard that some traders use most visible open/close prices in places of most visible high/low prices to draw support/resistance lines/levels. Which one is the most suitable? Markets reacts to both. We consider both of them. However, high/low prices also cover the close price. That means, thinking based on resistance/support levels is much better than resistance/support line? The up trend started from the historical support in April-2015, which is the most visible in AUD/NZD in recent years, which was very strong support compared to 1.1302 R/L. And the uptrend is very strong. Short setup is not in the BUB, and the last week candle stick has long shadow conform up trend will be continued. Additionally, there is not strong short signal in daily chart. It is going to start Wave 3 in weekly chart. Thanks for giving us an opportunity for brain storming. Surely we can learn a lot by doinf this excercise. This is a weak set up and reasons for my judgment are listed below. 1. In first place, there is no BB breakout at all. 3. BB lower and upper bands are away from each other. Now eager to know the detailed analysis and final verdict by. The resistance level seems like a valid one. Bulls are stronger but not completely in control. They can wrestle control from bears after forming wave B,followed by strong retesting of the 1.1302 resistance level and it possible breakout movement which is wave C. The upward movement before its halt by the 1.3202 resistance level is wave A. The downtrend on the monthly time frame has shown some exhaustation signals. Expect the current monthly candlestick to go down in an attempt to retest the middle band even if it won’t touch it before going up. Based on this, I think it isn’t a strong short trade set up; it’s merely a resistance level bounce off that could be ended to a strong uptrend after its retesting and, possibly, breakout. To be honest I don’t even see any setup worth considering. The only thing I spot was the engulfing pattern formed on a weak resistance level of 1.1302. Which in my opinion isn’t worth taking since I’ve tried to trade this way, treating support/resistance levels just as Bollinger bands. my response is purely around BB as I don’t use Elliot waves. BB breakout weak. Uptrend appears not to be exhausted. BB wide apart. The level does not appear strong. Hi, thanks for the quiz, I feel it is not a strong set-up. I don’t use Elliot waves in my analysis so I am unable to comment in this regard. Thanks for all you do. God bless you. For this matter above, therefore I don’t see anything to that can induce my guts to trade. Simply because I’m trained by you and trained on currencies and not stokes, I take only the strong set-ups we trust in currency market, that is Only strong Engulfing patterns, accompanied by strong bollinger band break out, and on exhausted (tired market) trend. Only I can trade, Harami if it is confirmed by engulfing candlestick covering the “mother and the baby”. Sir, I don’t see anything to trade above. Therefore I do nothing and keep my money for the strong set-up. Elliot wave is a question of me knowing and since I’m not good at it, Warren Buffet said I we should invest only where we have good knowledge otherwise we do nothing. Can you please see this am i correct ? Why didn’t you consider the 2015.01.11 candlestick low price? many thanks for your constant support and teaching. As you said, it is the monthly chart that shows you the maximum and minimum of each market’s capacity, each market is like a “container” and it has a special capacity. On 2015.04.01, AUD/NZD monthly time frame has reached the bottom of the container (1.0285 level). The price has reached its lowest price and it has no way but going up because breaking below 1.0285 level under the present economic condition looks impossible. Some big changes in Australia and New Zealand economies would be necessary if AUD/NZD wants to break below 1.0285 level (such changes usually don’t occur so frequently). So, AUD/NZD price is determined to fluctuate between 1.0285 and 1.3643 levels (container capacity). The 1.1302 Resistance Level is not strong and the price is starting to retrace on 2015.07.01 (beginning of wave B or 2). Therefore, we should be ready to go long at the beginning of wave C or 3. On 2015.04.01, the MACD oscillator also shows a clear convergence which reinforces the scenario of a reversal movement. On 2015.06.28 there was a strong UBB breakout that tested the Resistance Level at 1.1302. I don’t see this breakout as a clear sell signal by itself, however the next candle is closing with a bearish body showing that the bulls, who had been in full control since 2015.04.05, are a little weak / tired and they could take a breath. The following two candlesticks, 2015.07.12 & 2015.07.19, formed a short trade setup that reinforces this lack of momentum (MACD 12,26,0 histogram corroborates). Although this trade setup is formed by a good engulfing candlestick pattern, we shouldn’t score it as a 100, maybe 85-90. However, we could see a decent retracement. I don’t consider the 1.1302 resistance level a strong one, however it is strong enough to stop the bulls for a while and make the price retrace to form wave B or 2. On 2015.04.05, the MACD oscillator (12,26,0 & 24,52,0) also shows a clear convergence in the weekly time frame (reversal chart pattern). The slower settings of MACD indicator (24,52,0) helps me to remove most of the price noise and I could see the long trade setup by 2015.04.05 Anything has changed since then and the MACD histogram is pointing up. So, no signs of an important downtrend. The Bollinger Bands are heading up and far apart, showing the strengh of the bulls. So… what are you doing in a trading website? someone makes 100$ and donates 10$, someone makes 1,000,000$ and doesn’t donate a dime.